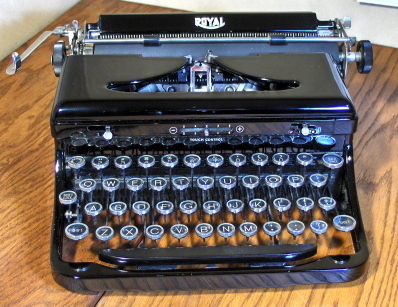 Royal Typewriter, circa 1950s. Photo credit: mrtypewriter.tripod.com. A year after I’d lost him, I taught myself to touch-type. I relished our old Royal, his old Royal. I loved how the keys plunked and the typebars clattered, how the letters appeared neatly on the line, one after the other. I reveled in the ping of the bell and the thwack of the carriage return. 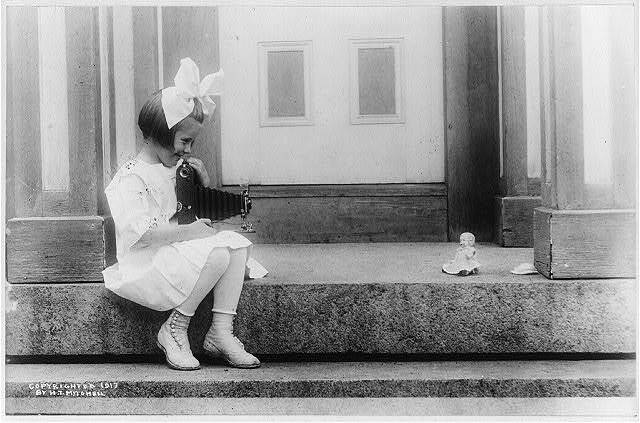 By the time I finished the lessons, it was not the typewriter’s music I craved but its lyrics: a powerful word, a deft sentence, a paragraph that leaves you breathless. Although I knew my father had written, I didn’t expect the thick envelope of manuscripts my mother presented me when I turned forty. From it spilled war stories and postwar stories, war poems and love poems, the first chapter of a novel. He’d dreamed of a life as a writer and, judging by his professors’ comments, showed promise. Then he joined my grandfather’s warehouse business so he could marry her and have me. He packed those pages away, planning, I suppose, to return to them when the business got to its feet and we kids could make our own way to school. My manager and my writing mentor want me to write something commercial instead of another passion project. I see their point. But I conjure the smoky late-night staccato of my father at the Royal. No. I don’t think so. I am grateful for your interest and comments. It is comforting to know that my father’s words, even now, can move those who didn’t even know him. Copyright © 2010, John Unger Zussman. All rights reserved. 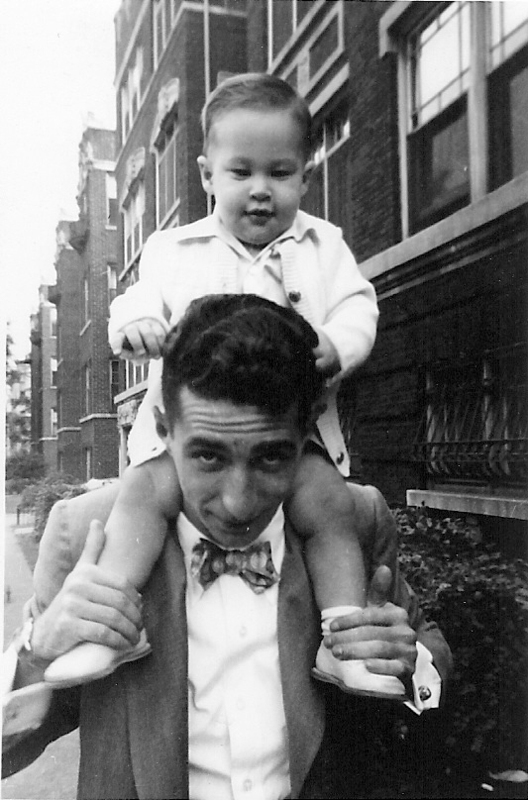 Myron Unger and his son John, circa 1951. This month, I continue that story with an essay on life and parenthood by Mickey himself. Mickey studied writing and psychology in college, hoping to pursue one or even both. But when he returned from naval service in the Pacific, he was eager to marry my mother and start a family. He entered his father’s business instead. Still, he continued to write when he could, and penned this essay sometime in the ’50s. I find it beautifully crafted, unbearably wise, and eminently worth sharing. Next month, I’ll post a reflection on a father’s legacy. Again, I want to acknowledge and express appreciation to my mother, Lois Zussman, and my adoptive father, Milton Zussman, who remain active in my life today. I am blessed with a heritage from three parents, not just two. Probably very little of what you want to give him. For what do you tell a little guy that you can barely catch up with as he dashes from room to room helping Mommy fix the party. You might put your hands around his little waist and lift him high over your head and laugh while he squirms and giggles, but what do you tell him? Or you might sweep him up in your arms, swing him unto your lap, punch him in his tummy and run your hand through his tangled hair as he struggles to get away, but what do you tell him? Or you might accept his invitation to play marbles on the floor with me, Daddy …… and he sticks his chubby, dirty hand into his pocket and brings out ten shining, colored symbols of his boyhood and says I’ll loan you one if you give it back to me, Daddy … and when he jauntily sits down on his knees waiting for you to take firsties, you wonder what to tell him. And then it comes to you that it still isn’t your turn. Not while God and his mother make his body erect and his mind alert. And you think that his is really a simple love which comes through in his quick hugs and his warm smiles and his rollicking Hi, Dad when you come through the door. And so he asks little but the confirmation of your love and there remains little you can tell him about this. And this is probably right. For what can you tell him that he would understand? Can you tell him about the dreams you’ve had for him long before he came into your life? Can you tell him how you remember being a boy? Can you tell him about your father, your marbles, your birthday cakes? And then it comes to you that even if he could understand, you couldn’t tell him, because you don’t understand. And you wonder about this because you wonder what you’ve been doing while he’s been growing up. What have you learned? If this was the right time, what could you teach him? What happened to all those firm convictions you had when you left college? Were you right about life, about love, about God? Once in your life you were confused and you asked questions and you got answers and now you’re asking the same questions and you’re not sure you remember the answers. And you begin to think what do I tell myself, the father of the boy who has reached the age of three? Yes, and awareness that the stuff of life is a thin fabric and you can catch it only in seldom moments of quietness …. and the rest of the time, you work on impressions and fleeting recollections of knowledge. Once, when you first held a girl you loved in your arms and smelled the sweet fragrance of her hair and felt the smooth flow of her body and knew she felt you, you held the fabric. And once, when you stretched hard and flat on the fantail hearing the spray gently splash across the deck and watching the sun slowly kiss the flowing horizon and then fall softly into the rolling, moving sea and you saw the other ships slipping silently through the dusk and you thought how these ships and these men and this ocean and this sunset belonged together and you were part of it and you belonged too, you held the fabric. And there was another time, much later, when you stopped your car in the middle of traffic and picked up the dog and carried it to the sobbing girl waiting on the street corner and you gave it to her and she stood on her tiptoes and kissed your cheek and then ran away in childish embarrassment scolding the dog, her tears turned to mock anger. And when you got back into your car and waved to the honking, scowling street, you felt sheepish but warm. And you thought how long it had been since you last held the fabric. And you think if this is the true matter of life, what is all the other? And you think why can’t you be wise and aware each moment of each hour? And you think why must age bring the callowness of repetition? Now you remember the pledge of your youth and a bewildering enigma startles you. For when you were young and intense you wished for maturity so that you would understand and mellow. And now that you were older and mature by men’s standards, you have lost the spark and thrill of youth and must go out to search for the feeling. Or is this what man has done to man in the guise of becoming civilized? Here are the questions then that you must answer before you tell him anything because maybe it’s not too late for you. Three years is a wonderful age, you reflect; full of magic and warmth and treats and laughter and toys and bulging pockets and runny noses and red cheeks and wet shoes and band-aids and stuffed animals and playing old, and the wonderment of the whole, huge, whirling world which to a small boy means fun. Thirty years is a wistful age, full of old dreams and new doubts and old ambitions and new fears, and maybe a good place to stop for a moment to total up the ledger and see where you stand and perhaps revise and rededicate. And this is about as far as you can go. For you have come full cycle and you know again that your life doesn’t have the meaning you looked for, not yet, And you know that somehow, you’re falling short of the mark; that the blend of youth and age is still brewing and hasn’t yet mellowed. The vote is still out and you wished there was a place you could go to get it counted. Is yours a futile search? Perhaps. Yet, perhaps to search makes life richer even if you never find the answers. Perhaps life isn’t easy because it is rich. And so it comes to you that it will be up to no man to answer your questions. That you must search and find yourself. You’re suddenly very glad your three year old doesn’t question your smile. You’re glad he’s young enough not to doubt you. When you shove him under the covers and turn out the light and kiss him goodnight, you pray that God and his mother keep doing their work while you look for the fabric. Myron Unger died of cancer fifty years ago next week, on October 11, 1960. He was 35. Copyright © 2010, Myron Unger & John Unger Zussman. All rights reserved.